Developments in China have recently been a major factor in defining the prevailing sentiment in the forex, equities, and other markets. But what about the underlying fundamentals? Do they provide any hints on whether or not China’s Q3 2015 GDP will show a slowdown when it’s released on October 15? And how might China’s GDP reading potentially affect the forex market? Well, read on and find out. 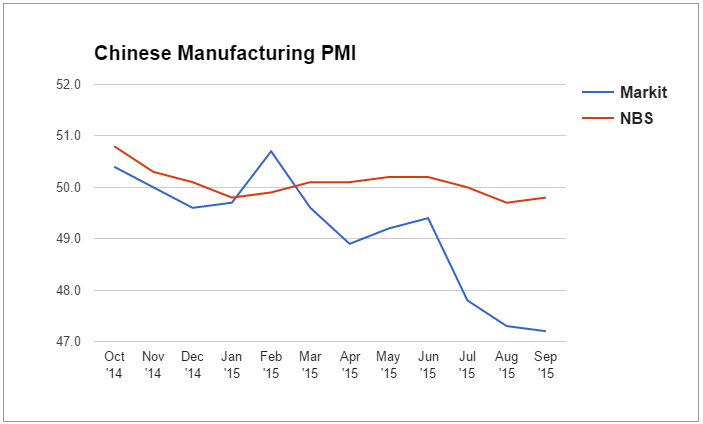 The September readings for Markit-Caixin’s manufacturing PMI (47.2 current, 47.3 previous) and the officially-sanctioned manufacturing PMI (49.8 current, 49.7 previous) from the National Bureau of Statistics of China (NBS) are both showing that China’s manufacturing sector is still contracting, but they’re at odds again since Markit-Caixin is saying that the beleaguered manufacturing sector deteriorated a bit more while the NBS is saying that the manufacturing sector is only slightly contracting AND that the contraction slowed down a bit. According to Markit-Caixin’s report the contraction was due a “sharper contraction of manufacturing output in September” caused by “worsening business conditions and subdued client demand.” The report also noted that this marks the seventh consecutive month of deteriorating conditions, with the current deterioration being the worst since March 2009. Meanwhile, the NBS report had this to say: the production index increased by 0.6 to 52.3; the new orders index increased by 0.5 to 50.2; the employment index was unchanged at 47.9; the raw materials inventory index was down by 0.8 to 47.5; and the supplier delivery time index increased by 0.2 to 50.8. Clearly, the reports from Markit-Caixin and the NBS are conflicting, especially with regard to new orders and production, since Markit-Caixin is saying that lower production due to fewer orders was the primary cause for the continued contraction while the NBS is saying that both sub-components are now expanding since they’re above the 50.0 neutral mark. Chinese businesses may be struggling, but the average Chinese consumer is still pretty upbeat since Westpac MNI China Consumer Sentiment Indicator showed a further increase to 118.20 for the month of September (116.50 previous). The retail sales data for August is also showing a decent 10.8% annualized increase (10.5% previous), with most sub-components showing impressive double-digit increases. Quite understandably, the only drag was the “petroleum and related prodiucts” sub-component, which printed declined by 8.8%. The consumer price index (CPI) for August advanced by 2.0% on a year-on-year basis (1.6% previous) and by 0.5% on a month-on-month basis (0.3%). The primary contributors to the year-on-year increase were a 3.7% increase in food prices, a 3.8% increase in the prices for tobacco and alcohol, and a 2.9% increase in the price of clothing. The main drag, meanwhile, was a 2.1% decrease in the price for transportation and communication services due primarily to a rather large 16.4% drop in the price for fuels and vehicle parts. Overall, it looks like domestic consumption in China is rather healthy, althiugh China is also feeling some deflationary pressure from the recent decline in oil prices. As for the producer price index (PPI) for August, it kept sinking ever lower into negative territory at -5.9% (-5.4% previous). This marks the third consecutive month of deteriorating PPI after stabilizing at -4.6% between March and May of this year. The details of the report show that the major downers are all related to energy and iron: the coal mining industry is reeling hard at -14.0%; the natural gas and petroleum extraction industry slumped very hard at -36.8%; the iron ore mining industry had a very unhealthy -21.1%; and the petroleum processing industry had a painful -21.5%. Most other industries were also in the red. The only exceptions were food manufacturing (+0.1%), textile manufacturers (+0.7%), wood and bamboo processors (+0.1%), pharmaceuticals (+0.7%), and water distributors (+2.3%). All the rest were either in the red or stagnant. As I noted in my previous monthly review for China, consumer spending was one of the key factors that allowed China’s Q2 2015 GDP to grow by 1.7% on a quarterly basis and by 7.0% on an annualized basis, with the latter being the target growth rate of the People’s Bank of China (PBOC). And, fortunately for China, the recent official data shows that consumer spending is still robust and is even improving. Another major contributor to China’s economic growth is the manufacturing sector, but it’s either slumping hard (if you believe Markit-Caixin’s report) or just barely contracting (if you believe the NBS report). Either way, it’s potentially gonna be bad for Q3 when you consider how the manufacturing sector fared back in Q2. It’s also rather strange that CPI is improving while the PPI is deteriorating even further. It is almost as if the producers aren’t passing on the lower prices to the consumers (thereby acting as a deflationary pressure) given that most industries had negative PPI readings. Ultimately, though, China’s GDP reading is gonna be released by the Chinese government, and some market analysts and forex traders are already skeptical when it comes to the officially-sanctioned data. In any case, if China’s GDP does show a slowdown, we can probably expect more bouts of risk aversion and forex traders fleeing to the safe-havens. But on the flip-side, if China’s GDP growth remains stable or improves, then we can probably expect some demand for the higher-yielding currencies, especially the comdolls.